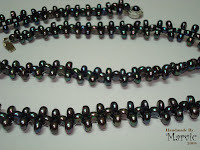 Erince commission me to redo her pearl necklace. So I reused the pearl to make a necklace and a bracelet. Nice la Maria! I like! !